This article is connected to https://github.com/cloudfoundry-community/codenvy-cfrunner/ which is a codenvy runner I've made for Cloud Foundry To understand what we will do in this post you need to know what is Codenvy and Cloud Foundry. Pivotal Cloud Foundry® is a Platform as a Service (PaaS) that supplies developers with a ready-to-use cloud computing environment and application services, all hosted by virtualized servers on your existing public and private infrastructure. You can have a look at this good overview from their new website: http://cloudfoundry.com/. 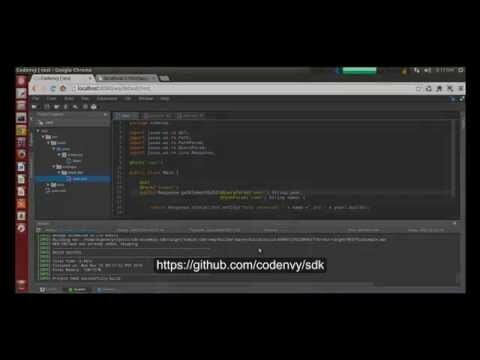 If you watch the previous videos you will see that Codenvy provides a runner that gives you the possibility to run your webapp directly from Codenvy. These runners are, in fact, docker container which uses LXC, an operating-system-level environment virtualization for running multiple isolated Linux systems (containers) on a single Linux control host. And use Dockerfile as a recipe to create tomcat server, apache server or to go runner and to start them with your source code. Although Codenvy acts like a PaaS,it isn't, it is an IDE in your browser. These runners are really good for rapid development but why not to use the Cloud Foundry power to run your app? Cloud Foundry is really good at auto-detecting your code's language, your dependencies, it can scale your app on runtime, create a good looking url and so on. 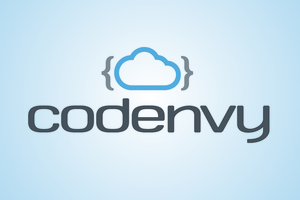 So let's create a Cloud Foundry runner for codenvy. As you can see this Dockerfile just installs the Cloud Foundry command line and Codenvy indicates to use command line inside of container to run cf push or all the other commands directly in command line. But Cloud Foundry can tail logs, can deploy automatically and can use manifest.yml file to deploy a webapp. # We create an name for our app next we run cf push with this appname and finally we tailed our logs. What's happening on Codenvy on this end? You will see your Dockerfile being run and on this end you will have all the logs from your app in your Codenvy console. As you can see we need to provide a name for our app directly in the Dockerfile which is not very flexible and if you want to change memory or instance number you will need to change your Dockerfile again. Hopefully Cloud Foundry uses the definition file called manifest.yml this file indicates the service you need, the name of your app, the env var you want inside your app... All you need to do is to put a manifest at your root project directory.yml and to change few things inside our Dockerfile (we will get the app name from the manifest.yml to tail logs). # We get the appName from the manifest.yml, we remove the `-` in front of `name` and we take the name with awk. Codenvy provides url like this: http://runner22.codenvycorp.com:52639/ when a runner finishes the process of giving you access to your app. As we deploy on Cloud Foundry with our own domain url we want to link this kind of url with our Cloud Foundry url. My solution is to serve something inside my container to redirect the url to my Cloud Foundry app by clicking on the url, provided by codenvy. .
We could do better to get the domain url. For that we could look at first, in the manifest file and fallback to the first domain found with cf domains if no domain has been found inside manifest file.